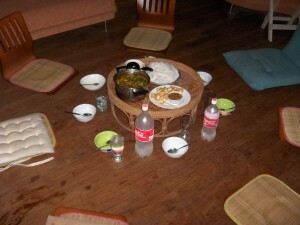 I have hinted about the food a few times, but here I will try to provide details. Now, to those who are expecting recipes, I must aologize. My curiosity has not led me to hover over the chef or ask many questions. I will try to do more research in the future. I have always been a passive fan of Thai food, with a love for Pad Thai and curries of all type. They seem to have the same cooking philosophy as myself, which my brother has described as “everybody in the pool”. Why have a supper plate with chicken, pasta, and broccoli all neatly seperated when they can be cooked together with some creamy cheese sauce and eaten out of a bowl? I dislike plates: food falls off, forks are normally required, and you can’t drink out of them. The only plate positives: dishwasher space and steak cutting. Spoon and bowl meals for me, which leads into the food here. Our chef, as I have previosly stated, is Irish and quite the cook. He spent his first 6 months here in Thailand in the northern part, where he purchased a food cart and specialized in pineapple burgers. He figured it would be a good way to meet people and get by. Wanting a change, he came down here as a WWOOFer about 4 weeks ago and brought his Thai female companion. Now he has a job as the chef and she as coffee shop manager, and they have there own room at the farm. He collects food from the local markets as well as the farm each day and whips up quite a feast. All meals get a full pot of rice from the cooker even when noodles are served. Curries or curry like mixtures are the norm with lots of greens. Main ingredients used are: Thai chillies, garlic, lemon grass, cilantro, Ginger, and chicken or fish. Sides are often cucumber, morning glories, and some squash like thing. He also always makes sauces that can be added to reach ones desired spice level. 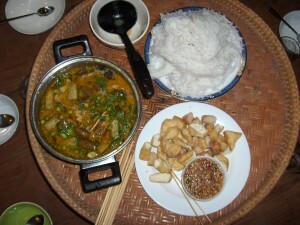 Examples: a basic chillies in vineger, a peanut sauce, or a ginger garlic sauce. I apologize to the chef, if he ever reads this, because the pics don’t do the meals justice. I have tried not to be one of those nerds that take a picture of everything that goes into there mouth. No offense meant toward anyone. Not all of my sustenance has been received on property. 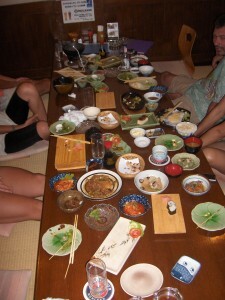 Just last night, we took a walkabout down the street and sampled some foods. No photos, so just use your imaginations, I will try to help with my words. First stop: fried wide noodles, pad thai style, with pork, egg, and greens (90 cents, delicious). Then: barbecued pork with thin noodles and broth (80 cents, good). Later: flavorful pork sausage type thing on a stick, served with cabbage (2 for 60 cents, food on stick, can’t lose). Dessert: fried bread folded with a frosting type substance (15 cents, crunchy). More Dessert: 3 spears of pineapple (60 cents, always a favorite, my goal is to purchase each time I see it). Last: 3 different types of little round things that look like fish eggs, or eye balls, but might be soy related, served in steamed soy milk (15 cents, sweet and creamy). Other food I have put into my body: Beer Chang which is a “full flavoured lager” and the “pride of Thailand”, according to the bottle. (Satisfying and currently being consumed). 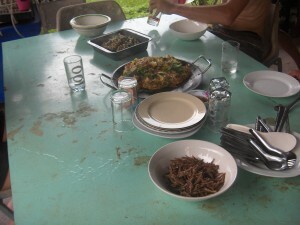 Fried grubs and cricket legs, Coconut milk banana smoothies, and toast every morning. 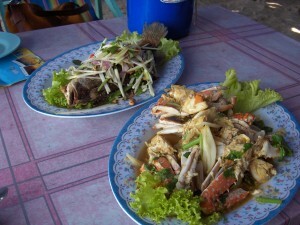 On the island beach, I had the crab plate seen below, which I would describe as buttery and scrumptious. If you have not read part one of this 2 part series, I suggest you scroll down now. Otherwise you will be completely lost and confused, so go ahead. 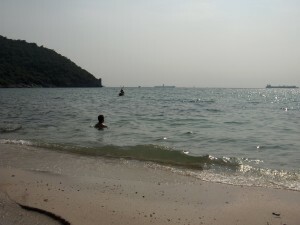 Alright, my Sunday adventure led me to an island about a days swan boat ride from Si Racha. The island goes by the name Ko Si Chang and and is not very flat. 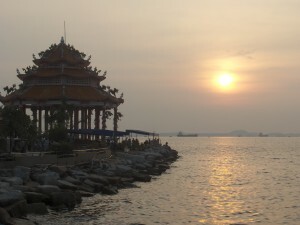 To get there, we got dropped off by our host and took a ferry that leaves from the Ko Loi jetty. On the way, we passed numerous ships anchored in the Gulf of Thailand, that I think are waiting for paperwork or further instructions. Interesting to see. Once on shore, we avoided the tuk-tuks and motorbike drivers, and walked to the Buddhist Tham Yai Phrik Vipassana Manastery, or Typvm for short. Many meditation caves, incense burning, and hand written prayers can be seen in tucked away areas. 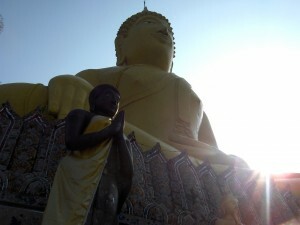 To get up to the Typvm was a hike unto itself, but we continued up another 300 stairs to see Buddha’s Footprint. The views got even better and were worth the blood, sweat, and tears. 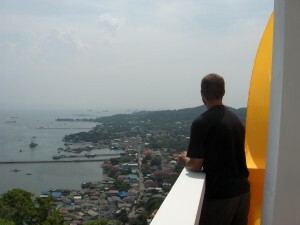 We hiked back down, unable to find any super fun happy slide, and commissioned a tuk-tuk driver to take us to a beach. Hat Tham Phang beach is tucked in a cove on the west coast of the island, and has a small sandy area, lined with umbrellas and water vessel rentals. 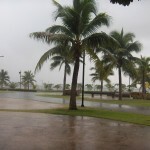 I enjoyed a large plate of crab, cooked in a butter sauce with some greens, under one of those umbrellas and watched the people frolic fully clothed. After purchasing a $5 swim suit, we headed for a spot on the beach and participated in the ancient thai recreation known as swimming. Large sharp rocks covered much of the cove floor, so we chose our steps wisely and proceeded to wade in the water. Although this beach is reportedly not as beautiful as the star attractions that this country has to offer, I was satisfied. My first thai beach was patronized by mostly regional weekenders with the exception of 4 other farangs. The post beach activities included: a ride up to see some golden buddhas, a climb down through a small cave, a monkey sighting (no picture, it was too fast), followed by a walk back to the pier. Host ordered many many dishes and all staff members stopped what they were doing to acknowledged our arrival and departure. My first time eating in a establishment where I had to take off my shoes (which I agreed to because I wasn’t wearing a wire) and where all people receive a warm moist towel upon sitting. Food was delicious. 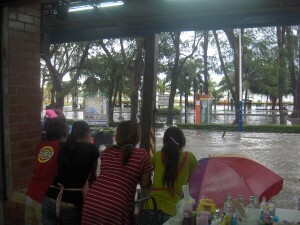 My fellow Americans, as I have stated before, Bang Phra is the town where my farm is located. 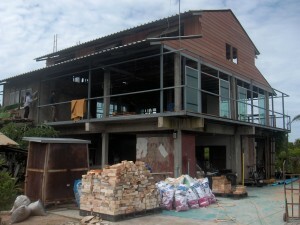 It is small and lies on the Bay of Thailand, a short nap on a train from Bangkok. Since it is on the coast, there are some other cool cities and things to see up and down the main highway. With a couple scattered days off, I explored 2 such areas and would now like to report back to you all about my adventures. The first and closest rad city is called Si Racha, about a 20 minute and 33 cent ride south on the back of a “sorng-taa-ou”(small truck with a roll cage). 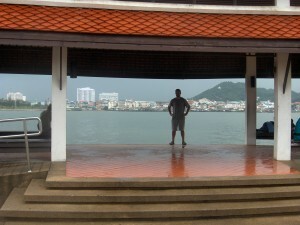 Our exploration took us out onto the Ko Loi jetty, where a Buddhist temple and boat dock are. It was fun watching the tuk-tuks get stuck and all the motorbike drivers just hanging outside the 7-eleven. 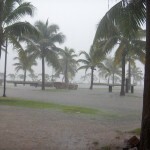 Locals were saying they hadn’t seen it flood this bad which made us feel lucky to have witnessed it. After making our way around town, taking off sandals to cross the street/rivers, we visited a few covered markets and a large mall. The mall was not very wide, but went up about 6 floors. They have a food market on the bottom floor filled with street vendor food, and the arcade was on the top floor. Sony Playstation’s entertained the kids instead of classic upright systems and I dominated the pop-o-shot. It was a good day, which made all the farm work worth while. I realized that I will have the free time to explore and take advantage of my semi-free accommodations. Also, the work is feeling less like slavery now that I am more invested in projects. I had a few run-ins with Thailand’s creatures the past 2 days and figured I would share. Starting with the least deadly: I gave the Ducks some food and seemed to have made them very happy. The Ducks also escape often because the green fencing around them is very weak and has holes. Thus, almost everyday there is a duck roundup, where we corner the escapees and throw them back in. I recommended that we make an example out of one of the fugitives and have a nice dinner, but that got shot down. Today, while we were working at the house, Mango saw a snake in a tree. 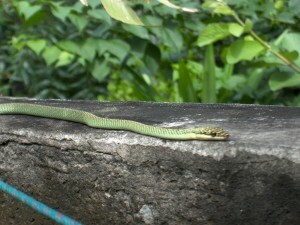 We observed it moving along a wall and later identified it as the Golden Tree Snake. Despite the name, they are normally green and prefer woody perennials. They spend their free time sun bathing and feasting on mice and geckos (which are all over the house property). These snakes are not supposed to be poisonous so Kay decided to touch it, i’ll let you know if she dies in the next few days. 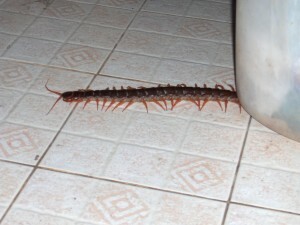 The last and deadliest beast I grappled, was a centipede in the outdoor kitchen. Now, this wasn’t one of your run-of-the-mill, sweet, cuddly, pick’em up and let them crawl around in your pants, US centipedes that call their grandma’s everyday. This Arthropod was 2 feet long and its body was an inch wide. They are poisonous and gorge on spiders, worms, and water buffalo. I held back the cat, while the Host picked it up with tongs and smashed its head with a piece of wood. A rumor is going around of a cobra sighting on the farm, so I will try to get close enough to take pictures, even if that means absorbing a few bites. The past couple days have roused my senses and I will be watching my steps closely. Everything else is good, although the scars are adding up and the anti-biotic is running low. Well, time to go wait in line to receive my days rations. ฉันมีสองกล้วยคุณชายวันนี้? 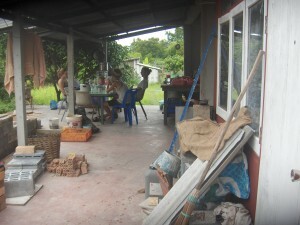 My first stay is in the city of Bang Phra, which lies about a 3 day walk SE of Bangkok. The Farm is separate from the House, where we all stay, and so far our work time has been split between the two. The goal is to convert part of the House into a coffee shop/massage parlor/spa. My projects there have varied from laying brick, to moving furniture, and also grouting a tile counter. Everything has changed, absolutely nothings changed. WWOOFers currently sleep in the Thai massage room on mats. 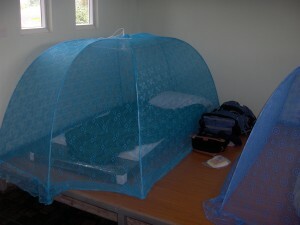 The room stays cool with fans and they provide some nice mosquito nets. Getting enough sleep has not been a problem. The main part of the house has a nice TV, tons of DVDs and books, assorted musical instruments, and WiFi. The property also includes a pool (being repaired), a sauna, and a Koi pond. The only difficulty has been keeping things dry. The Farm has a house currently under construction surrounded by many small fields and enclosures. Eventually, this is where WWOOFers will stay, maybe even me. I would estimate the property to be about 12,545,280 square inches, which as you all know, is not that big. Contained in those inches, they have a chicken coop, duck pen, 12 puppies, small rice field, pond, herb garden, banana trees, mango trees, and many other random edible plants. We just plowed them a corn field and are working on clearing another field for more rice. Also in the works is a wood fire oven that needs some more bricks laid. I kind of like that everything is a work in progress, thus it should look drastically different by the time I leave. Seeing results, always helps with motivation. I can hear the crack of the whip telling me its time to sign off. กลับไปทำงาน! To help set the scene, I will now breakdown the other players in this story that is Micah:Unmitigated. My host shall be referred to as “The Host” in all future corespondents. He is a retired Naval Officer who specializes in Physic and Engineering things. He has dabbled in many military agencies and may or may not have been an assassin. Intelligent and full of stories and analogies, he can and will go off on any topic. The first WWOOF couple I met are recent college graduates from the Twin Cities and Chicago. They arrived the same day I did and will be here 3 weeks as well. “The bikers”, as they will be called, peddled 2 wheels nearly the entire route from Prague to here. During the past 14 months, they went down through Turkey, flew to and spent time in Egypt, before making their way to China and then down through Laos. Both are cool and laid back, and spark many discussions. My first night here, there was a couple from the west coast who will actually be moving to Portland when their trip is over. I will not give them a nickname, as they are now gone. Like me, they quit heir jobs, the guy was a brew master and the girl was in the film industry. Their trip is 6 months long and covers all SE Asia. Another of the departed is a female, former teacher from the bay area, who quit her job to travel. She WWOOFed in France, Italy, and Greece before coming here. 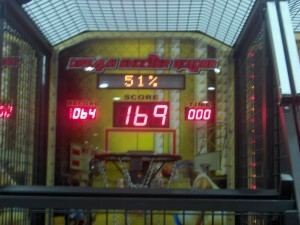 Again, no nickname needed. There is also and young female from the Twin Cities as well. She seems to be fresh out of college and is on an extended trip, with a return tentatively set for June. Her experience in construction and ability to do a triathlon, add up to one wicked WWOOFer. She shall be dubbed “Kay”, since it relates to her name in some way. Rounding out the current crop is a young man from Jolly Old England. He arrived the day before me and will be here 3 weeks as well. We may be going to the farm in Northern Thailand at the same time, although he is here for just 6 weeks and wants to see Laos. He shall henceforth be known as “The Brit”. In his previous life, he was a sound engineer who worked concerts, weddings, and christenings. He smokes a lot and doesn’t like soccer, but otherwise still a solid bloke. Side players include: The chef from Ireland (“Stout”) and his Thai girlfriend (“Al”), The Host’s cool flight attendant wife (“The Hostess”), and her sister (“Mango”), who comes around to cook and make us laugh. So, that is the cast of characters, in the next chapter, I may get to some actual farming stuff. I hope to incorporate some pictures as proof of my location, as well. All has been relatively smooth so far. 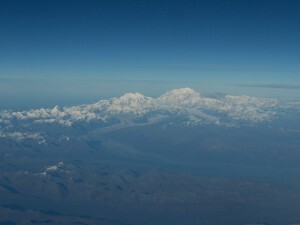 I enjoyed flying over Alaska and getting to see Mt. McKinley. Also enjoyed 3 movies and 3 1/2 meals. After not seeing a driver from my hotel, I got a “taxi” ride from 3 women in an unmarked car. A little sketchy, but I was confident that I wasn’t going to be driven down an alley and robbed. The next morning: I hopped a bus to Bang Phra thanks to a map I showed 5 people, figured out how to make a 3 cent phone call, and got picked up by my host on the side of a busy street. Nice place, 7 other WWOOFers here right now, no actual farming yet, amazing meal on coast with constantly full beer glass. The time has come. Tuesday morning, I will board the first flight in my 3 legged journey to Bangkok. I have been talking about traveling to distant lands ever since I delivered my resignation letter to FedEx Ground. A trip to Peru in July was a nice taste, but now I want some extended time overseas. 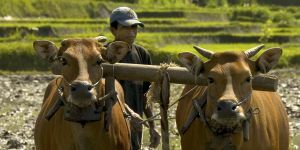 A few weeks of internet searches revealed an opportunity to volunteer on an organic farm in Thailand. The organization is called “World Wide Opportunities on Organic Farms” aka WWOOF. 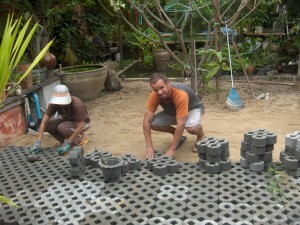 WWOOF has many branches and is also sometimes listed as Willing Workers On Organic Farms. I signed up with the WWOOF Independents group because of the number and variety of countries they list hosts for. From the list, I chose Thailand as my destination, due to the number of hosts (14), tropical climate, and inexpensive goods and services. The tentative schedule for my 2 months is as follows: 3 weeks on a farm an hour SE of Bangkok, 1-2 weeks on a farm just outside of Chiang Mai in Northern Thailand, and then 3-4 weeks of tourist activities. I will be joined in The Kingdom by my friends Dan and Alicia for a week, beginning on Nov 27th, which I am excited about. I decided to start a blog so that I can let family and friends know when I get into the snake trading business and drive a boat of missionaries into Burma. As the title suggests, I will try not to mitigate myself, after I figure out what that word means. I can already tell that it may take me a while to write each post, so in the future I will butcher the english language even more trying to crank them out. Thus I would like to apologize to all of those bloggers that I have secretly mocked, it was obtuse of me. Well, it’s time to start packing, catch you on the flip side. Cans of Diced Jalapenos, Diced Green Chillies, and Pineapple tidbits. Diced Onion, Cumin, Coriander, Chili Powder, Salt, and Pepper. A couple cups of Chicken Broth and some Orange Juice. I then set the crock-pot to about 300° and let it cook for roughly 6 1/2 hours. 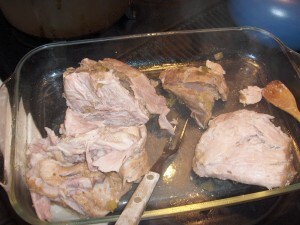 At that point I remove the pork from the pot and place into a glass baking dish for shredding and broiling. Using multiple utensils, I break the meat down into varying sizes and then cover with a couple spoonfuls of remaining juice. Dish is then broiled on High in the oven for a few minutes or until you see the tops get a little brown. 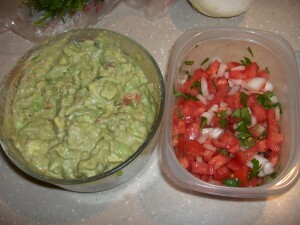 While the Pork cooked, I prepared some Guacamole and Pico De Gallo as accoutrema. The Guac is a creamy version with 3 mashed up avocados, lemon juice, diced onion, diced tomato, sour cream, and cilantro. The Pico is diced tomato, onion, cilantro, and lemon juice. My finished product may upset some purest, but I cook to my personal taste. For tortillas, I used the large flour instead of the smaller corn, which makes this dish more of a Pork Burrito. This was mostly by accident, as I do prefer the room the large tortilla provides but would have liked to have gone more traditional. 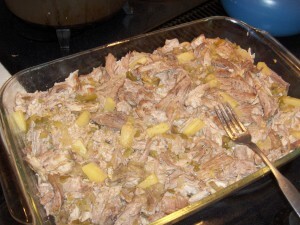 The flour tortillas are warmed in the oven for a few minutes and then topped with a robust portion of pork. The “taco” is finished with a shredded mexican cheese blend, guac, pico, sour cream, and a little more cilantro. Also, part way through eating, I crumbled some corn tortilla chips into the middle to added a tasty crunch. There are only a few things I may tweak for next time: First, I had too much juice and nearly overflowed my pot, thus I would decrease the amount of chicken stock. I would also try to make the pork a little spicier by either adding more jalapenos, hotter chillies, or some tabasco to the juice. 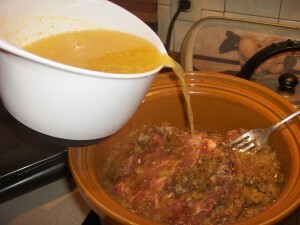 One other option I might try, is to create a rub and quickly brown the pork on all side before placing into the crock. 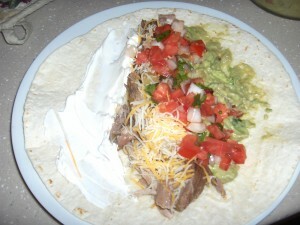 Lastly, I would use corn tortillas which I feel would highlight the pork more. All in all, they were delicious and I am glad I got through this food blog without making any threatening references to the U.N..